4 local artists share the stage to discuss what craft means for them. 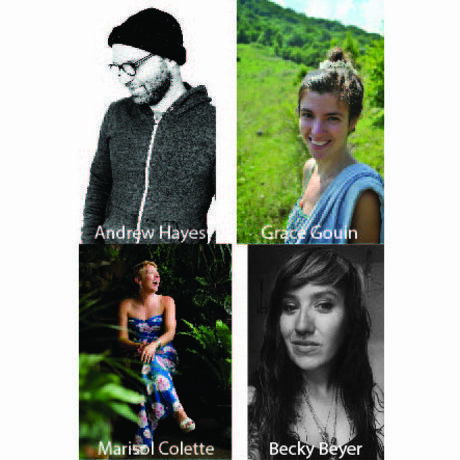 Join local Asheville artists Andrew Hayes, Grace Gouin, Marisol Colette, and Becky Beyer as they explore the topic of Craft and what it means to them. The month, the Audience Takes the Stage! Instead of our usual monthly speaker in June, four speakers from the AVL community will get five minutes on the topic of Craft. Andrew Hayes is a metal sculptor resettling in Asheville after a three year artist residency at Penland School of Crafts. Born in Arizona - Hayes left college to become an industrial welder to bolster his skills in the metal working trade. This background has served him on his path from student, to apprentice, and on to a full time studio artist. Marisol Colette is a Licensed Clinical Social Worker, intuitive and fashionista who has studied and taught in the field of trauma healing for over a decade. Marisol has a knack for seeing the inherent beauty, possibility and health of individuals, and shepherds them towards expressing a more authentic version of themselves through their personal style. Marisol can talk for hours, vision for days and is playful and gentle of spirit, believing life can be rich and deep while also being light and fun. Grace Gouin is a born maker with a love of all things related to natural fiber and clay, a deep appreciation of any time spent in nature, and a fascination with natural and human history. She currently works as the Creative Director at the Echoview Fiber Mill in Weaverville. Rebecca Beyer is a teacher and professional wild foods forager, Appalachian folk magic practitioner and artist from Barnardsville, NC where she lives on a community farm. She is dedicated to finding ways to help foster a bioregional land ethic in Appalachia through working to revive the connections between history, place and plants. She chronicles her work on her blog at www.bloodandspicebush.com.